I hope everyone is having a lovely start to their 2018! 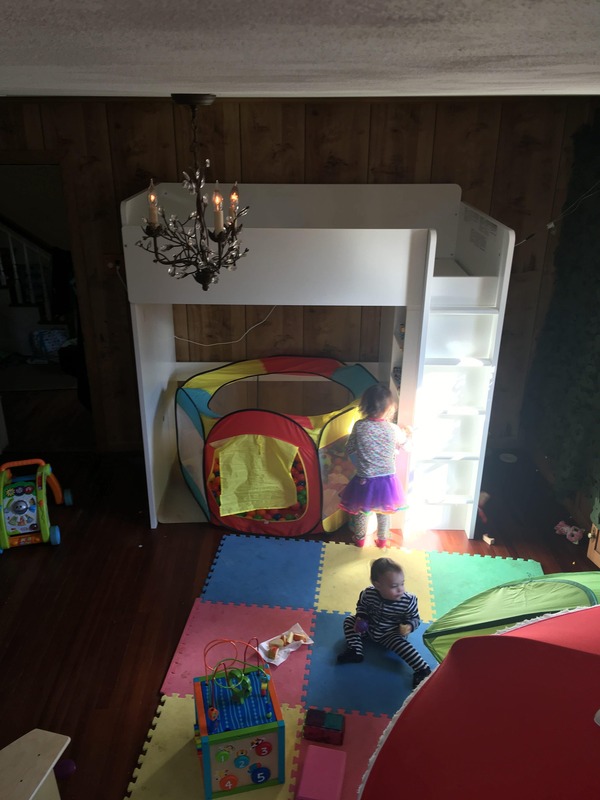 It’s –as always in our house– a work in progress, but I thought I’d share how our playroom is looking these days! Here’s a picture of David and me when we first bought the place. 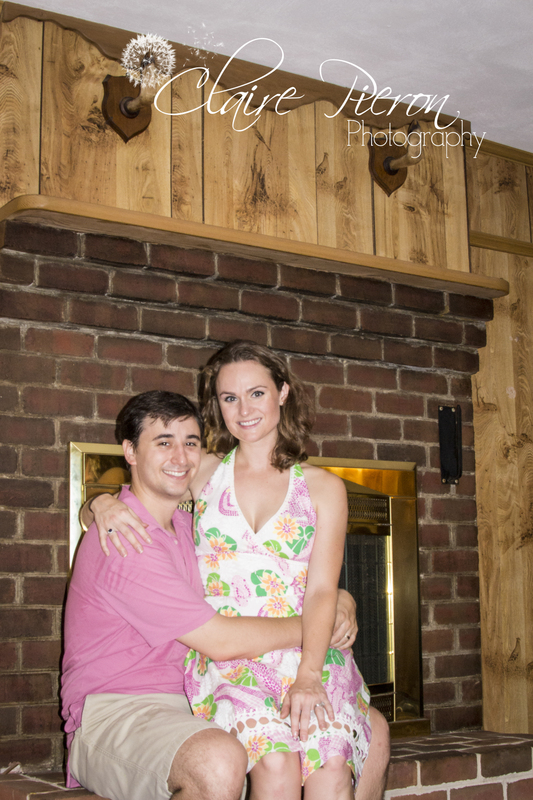 We posed for a picture here because the deer hooves shotgun rack above the fireplace mantle were hysterical and we figured we’d remodel that room right away. Well, for about 2 years it was our “clutter” room where stuff that didn’t have a home went, and then gradually it became Evie’s playroom. 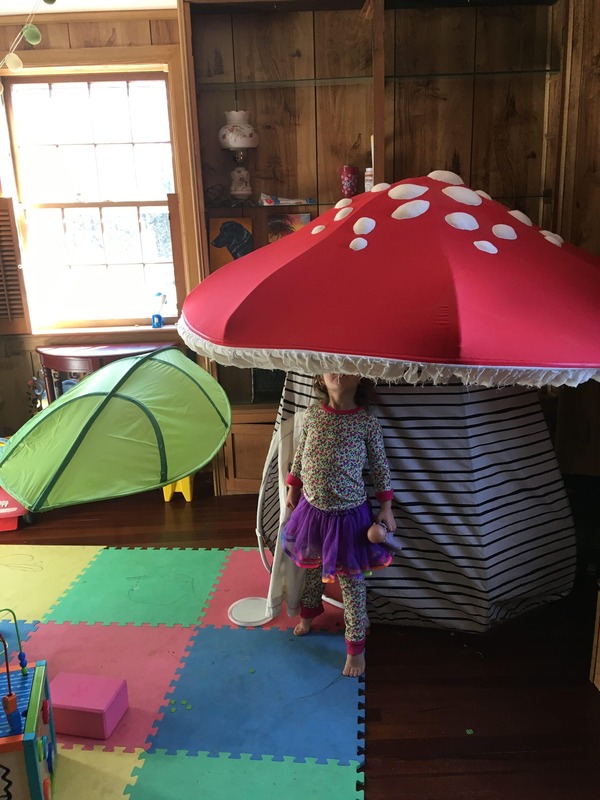 My mother-in-law gifted the kids with an awesome mushroom playhouse (from the Land of Nod, but sadly they don’t make it anymore! You can get a similar one here) and we got the cool green leaf from IKEA, and that kind of set the stage. 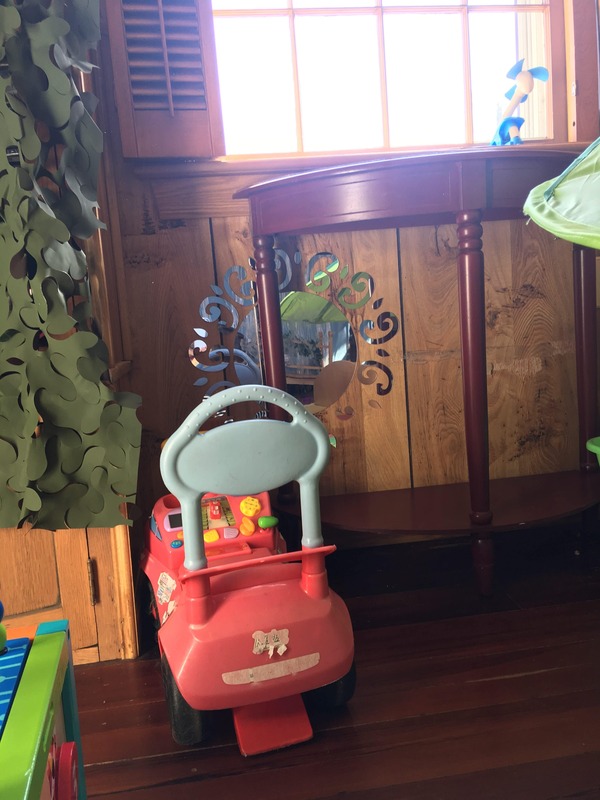 That toy chest under the window you can see above belonged to me when I was a little girl and it’s so solidly built that I don’t doubt it will belong to my grandchildren one day too. We removed the glass doors on one side of the built-in-bookshelves because 1) they’re cool glass and I don’t want to worry about the kids damaging them, and 2) I didn’t want fingers to get pinched in the doors, so they’re currently in the basement. We keep art supplies or random toys on the shelves. Haha in the above picture apparently I have a lamp that I am mentally noting to move when I’m done writing this blog post… that’s pretty fragile. Oops. 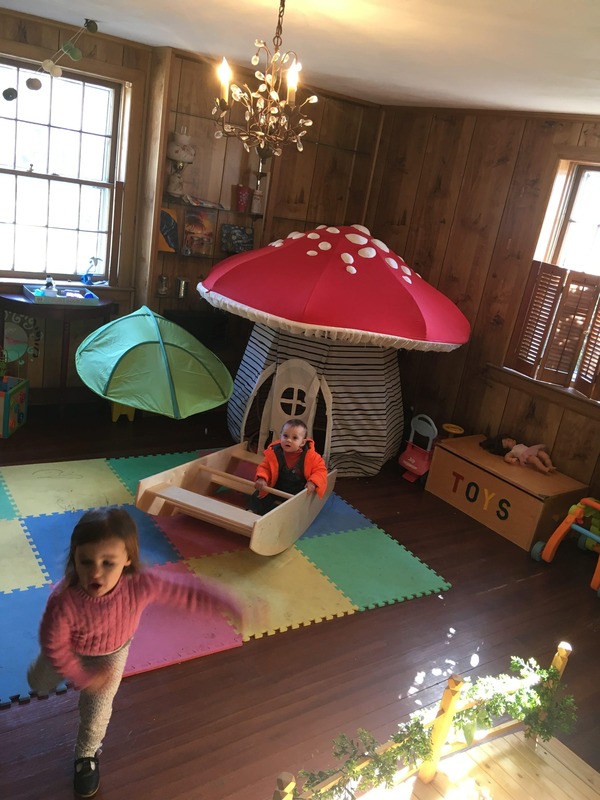 Anyway, the kids have the mushroom to play in the leaf to play under, and then by the window they have a little alcove that always seems to have things like a wheelbarrow or pretend car tucked away. 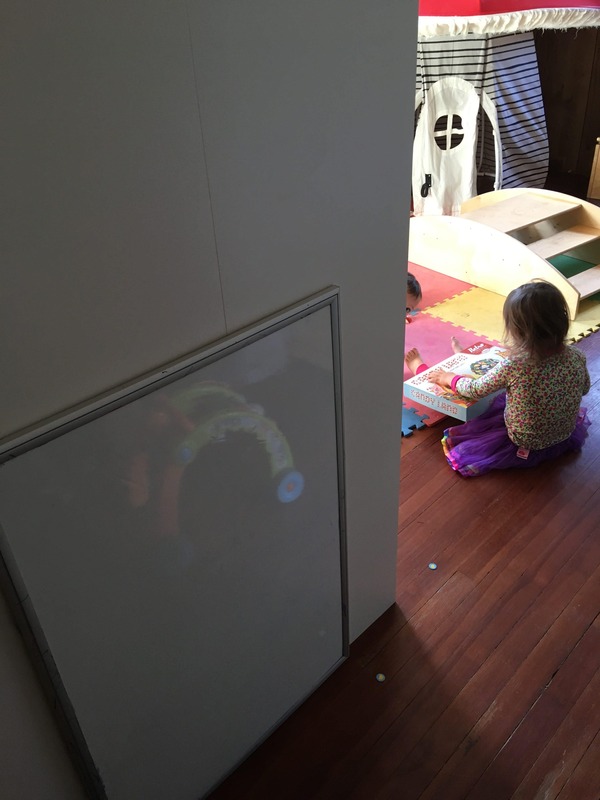 I affixed a mirror to the wall under the mirror that seems to entrance the kids whenever they catch sight of it. We also put some camouflage up (yes, like real hunting camouflage) over the other bookshelf. We kept the doors up on those bookshelves and inside are things that we’d otherwise store in an attic (but have no room in our attic thanks to the ever-growing collection of kids’ clothes). 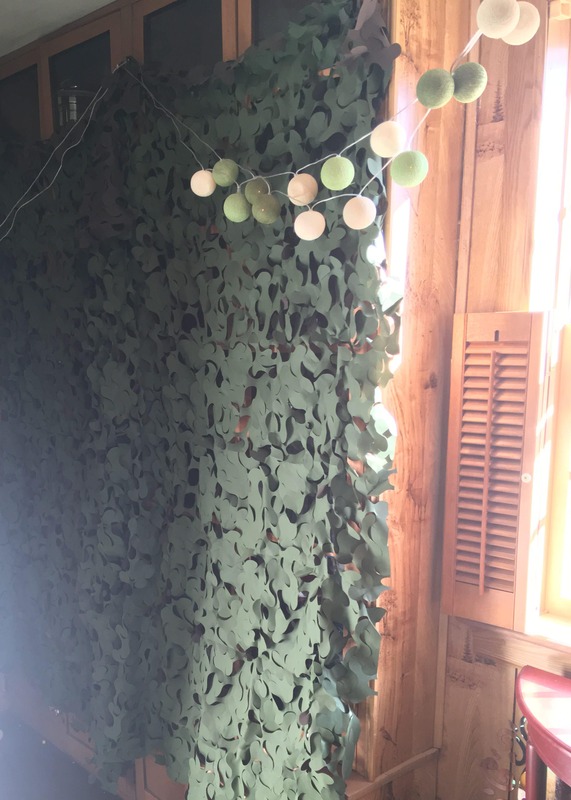 There’s our wall of camouflage. Isn’t it cool?! And above the camouflage is a string of lights that my friends in Germany gave me for Christmas one year. They’re pretty and fun (and green, my favorite color!) and seemed playful for a kids’ room. In front of the camouflaged bookshelves is an IKEA bunkbed that we’ve made into a “fort” for the kids. 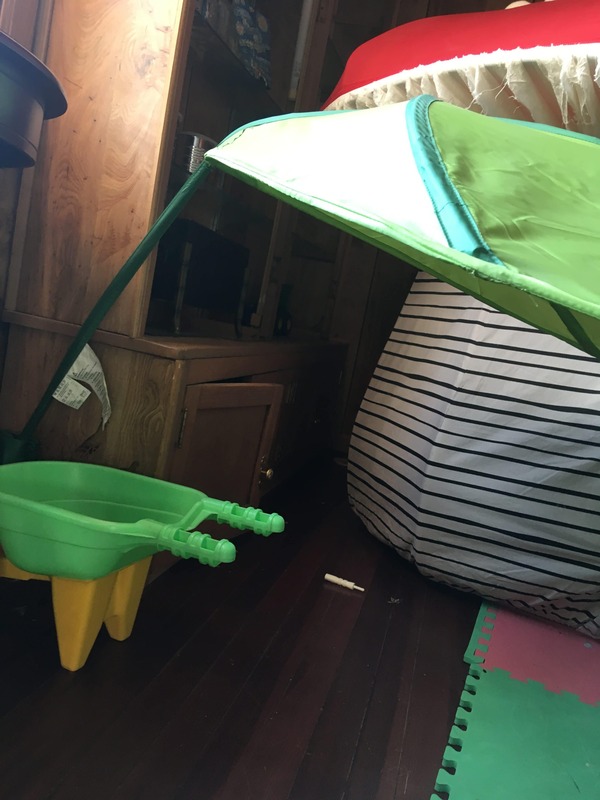 The top is just an area to hang out and a destination to climb toward, and the bottom has a ball pit inside. 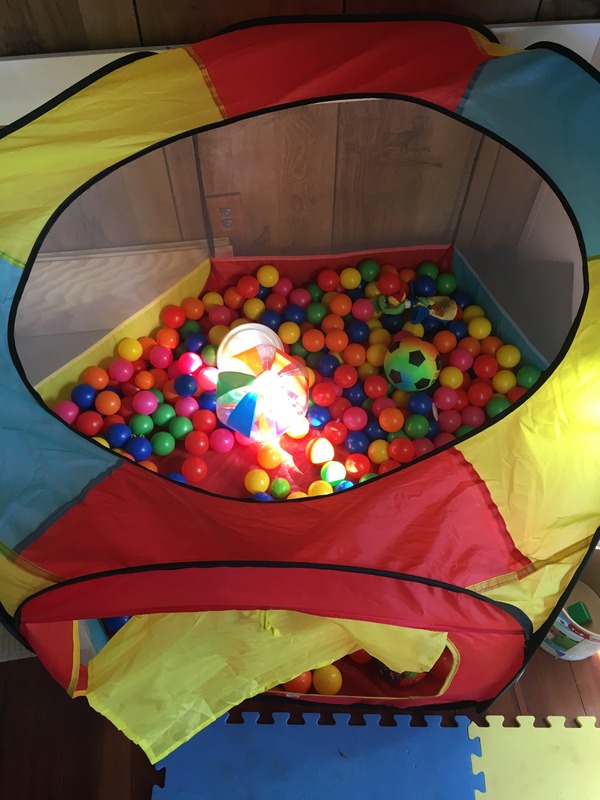 All of our balls make their way into the ball pit. It’s admittedly a fun time when we all try to get in there, and of course Kaiser the dog wants to come join every time someone else is inside, which makes things even funnier. 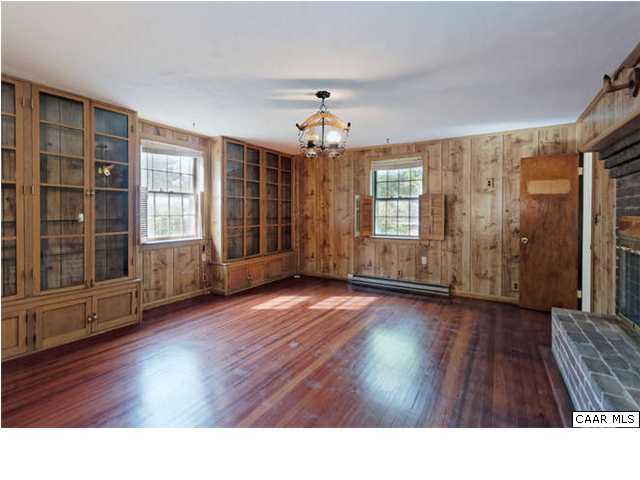 That brick fireplace mantle was definitely not safe for babies or kids to play on, but we weren’t about to tear the whole thing out just to make this room a playroom for a few years. 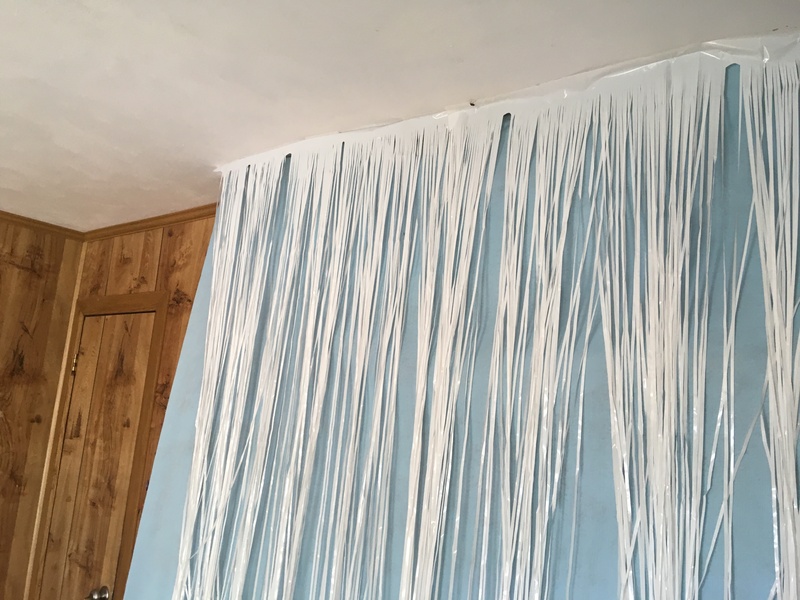 So we turned the fireplace into a waterfall, of course. 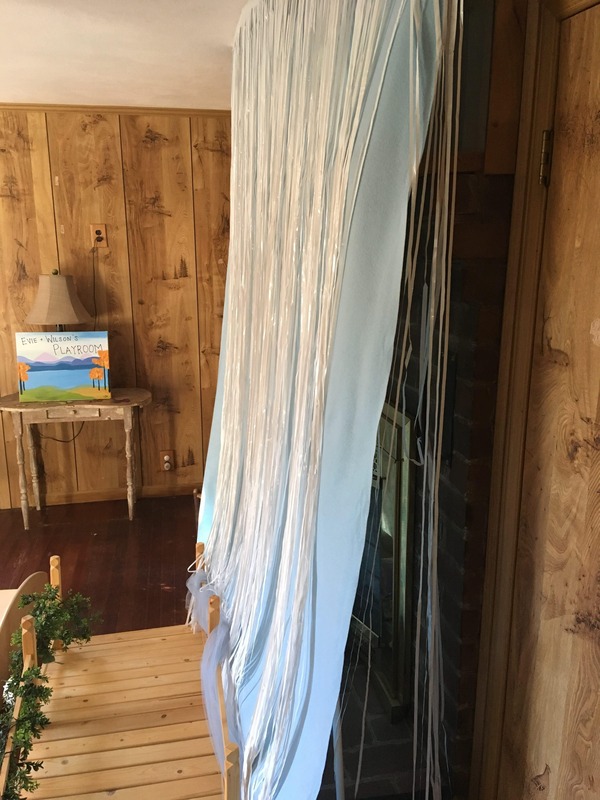 Then at the bottom we added some tulle, which makes it kind of look like mist or something, but also prevents the kids from pulling the white streamers off. 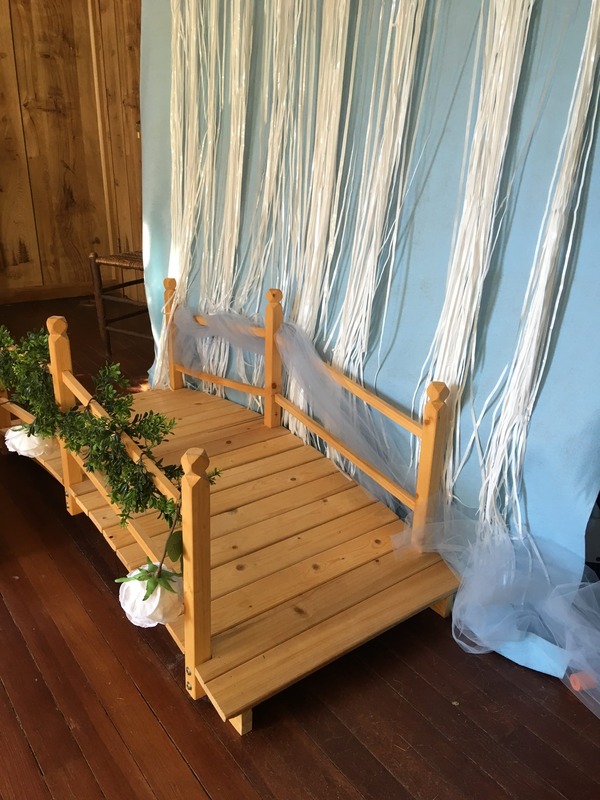 We have the bridge in front to sort of “direct traffic” so that the kids play in front of the waterfall and not try to play with it. 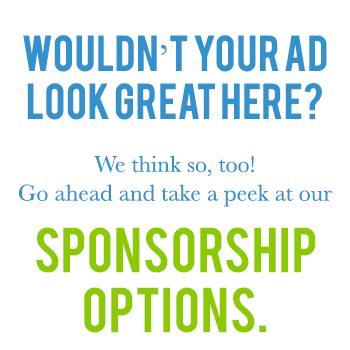 (It certainly wouldn’t last if it became a centerpiece of their play). This way it’s just in the background. 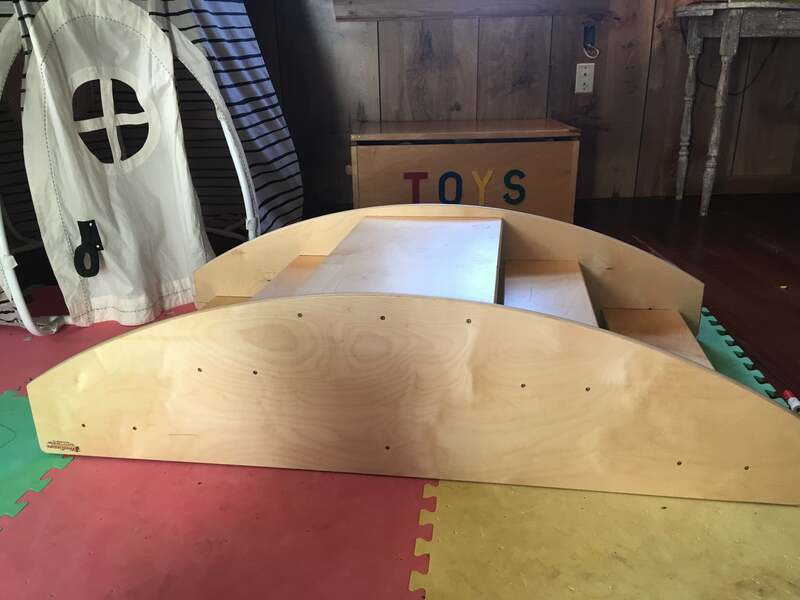 My mom gifted the kids with this step climber for Christmas last year (for her inspiration, see Janet Lansbury’s post here) and it has been a huge hit for the kids. Wilson started playing on it when he was just four months old, and taught himself (VERY slowly) how to go up and down each step. Even now at thirteen months he enjoys practicing at his own speed. When I went back to work after Evie was born, her daycare had one of these too. I’m confident this is why we never had to babyproof our staircase… both kids have lots of confidence in their steps and it is a beautiful thing to watch them explore and understand their limits. While the boat is fun, I never leave it on the boat side unless I’m in the room, just in case… but those brief moments when the kids get to play with the boat and have it rock back and forth are delightful. Lots and lots of laughter, and Wilson’s still just now getting the hang of it. 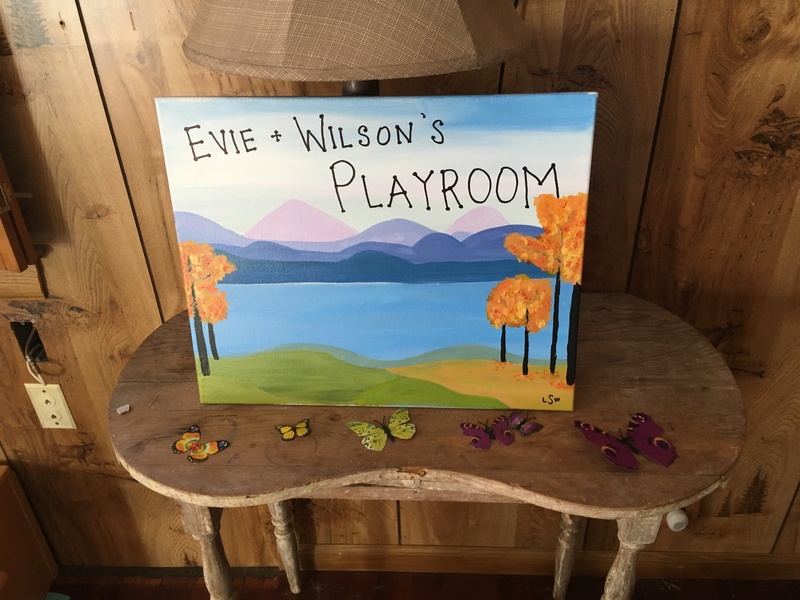 I like this playroom because there’s enough for Wilson to learn while Evie plays, and there’s enough for her to do so that she doesn’t get bored. 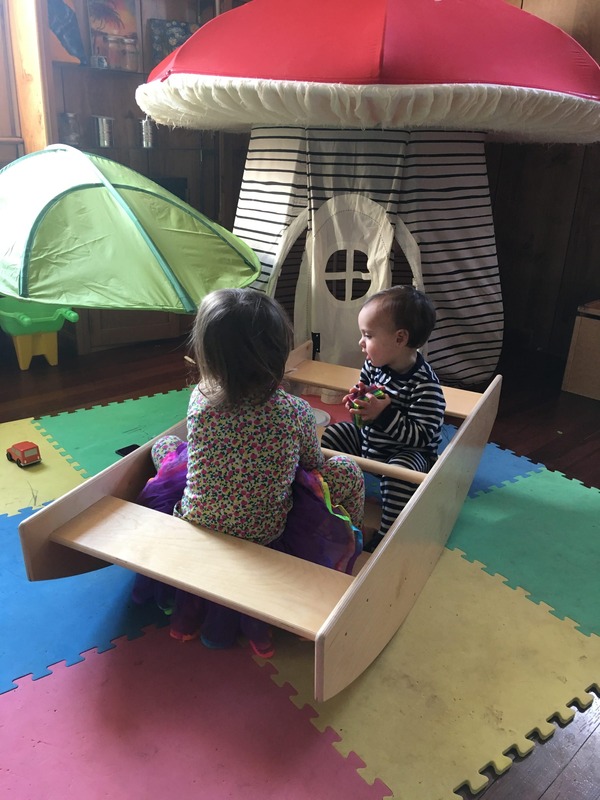 It’s a safe (enough) space now that I’ve supervised them playing in it over the past few months so that I feel comfortable leaving them alone for extended period of time while I do dishes, etc. in another room. Redecorating the Family Room Flip That! Fireplace Remodel Transitioning from Nursery to Big Girl Room KuneKune Piglets! 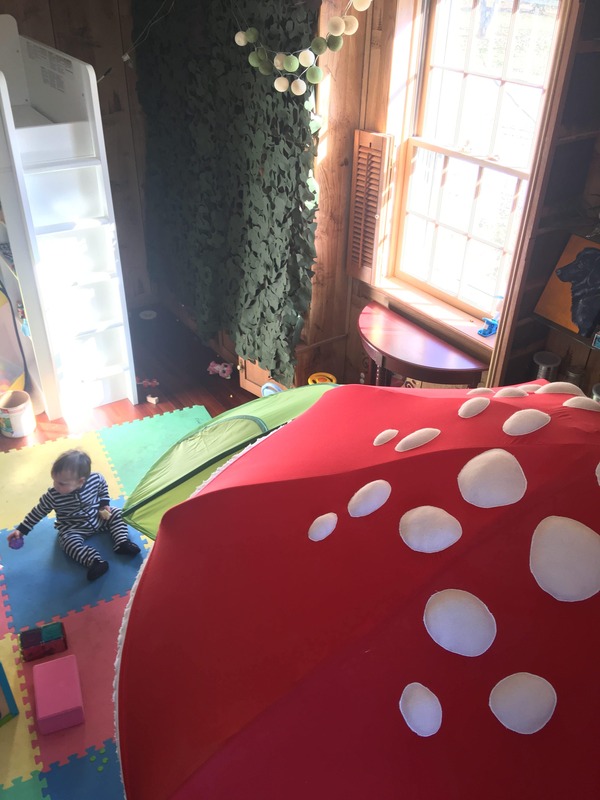 What a magical, wonderful, and creative playroom for 2 little ones !!! Great job, Lynne !!! ( And David). I bet the kids AND their friends absolutely love it, too.